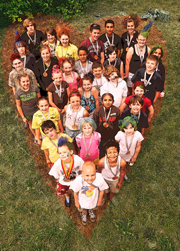 The Camp Goodtimes Wine Auction is in it's tenth year of supporting the American Cancer Society's pediatric patient programs, including Camp Goodtimes West and the Kayak Adventure Camp. Camp Goodtimes West: For 29 years, Camp Goodtimes has given children, ages 7-17, diagnosed with cancer a week to forget about their illnesses and just be kids. 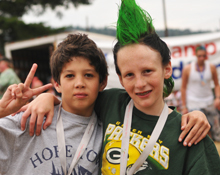 Camp is an amazing experience for anyone who has ever participated. It takes place on Vashon Island at Camp Burton. Kayak Adventure Camp: This trip offers the adventure of a lifetime for a variety of teens and young adults between the ages of 17 and 25 who have experienced cancer diagnosis. At the week-long Kayak Adventure Camp, participants paddle through the beautiful San Juan Island chain and pitch their tents at camp sites in northwest Washington. It is because of events like the Wine Auction that programs like Camp Goodtimes and Kayak Adventure Camp are sustained and continue to grow. Without your support, none of this can happen! To learn more about Camp Goodtimes West and its other Pediatric Cancer Programs and to check out the amazing pictures, videos and stories, visit its website at www.CampGoodtimesWest.org.